The MSW Youth Leadership Foundation was founded in 2012, after the passing of my grandmother, Myrtis Simpson Walker. The foundation's mission is to empower children in grades 3-8, to become entrepreneurs and leaders. We feel that there is a need to encourage children to follow their passion and live their life in purpose. Who was Myrtis Simpson Walker? 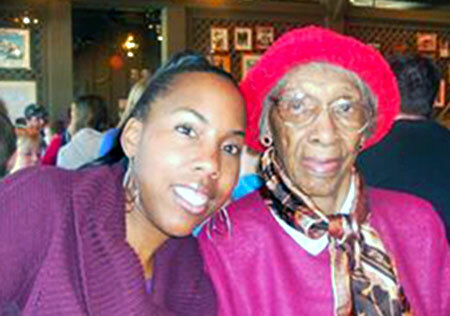 Photo: Executive Director, Cynthia Johnson, with her grandmother, Myrtis Simpson Walker, in 2010. Myrtis Simpson Walker taught for 25 years in Escambia County School District of Pensacola, Florida. She was a dedicated wife to Eddie Walker and a mother of two to Jeanette Walker Johnson and Cynthia Walker Brown and the grandmother of three very active grandchildren, Cynthia, Jamairo and Reginald. During her career she was the first teacher to integrate the school system in Pensacola, Florida. She lived a very long and healthy life for 92 years filled with volunteering, working in the community, working in the Church and most importantly showing her grandchildren the best of life. Myrtis Simpson Walker was also a volunteer and board member of Habitat for Humanity, Church Women United Volunteer and the charter member of The Ebony Red Hat Organization in Pensacola, Florida. She was a respected member of the community which you could always count on. She inspired me to do great things and to continue to live her legacy through this foundation. I am from Pensacola, Florida but currently living in Charlotte, North Carolina. Graduated from Bethune Cookman University with a degree in Psychology and a Masters Degree in Counseling from Hampton University. My career began as a school counselor in Alamance County. After spending two years in Alamance County I moved to Charlotte, NC to continue my career endeavors. I have always had a passion for working with children and wanting to instill positivity and motivation within them. It is important to me that children live their passion and live their best life. Finding out what interests them and helping them make it happen is what I enjoy doing. I am also a proud member of Delta Sigma Theta Sorority, Inc. and work as a volunteer committee member with The Charlotte Book Fair.